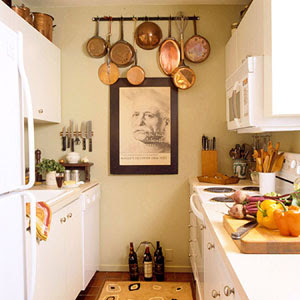 Charming and tiny kitchen--if this can work, anything can. 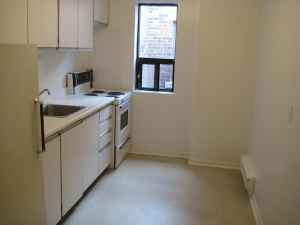 Kitchens in urban Toronto apartments are uninspiring at best. 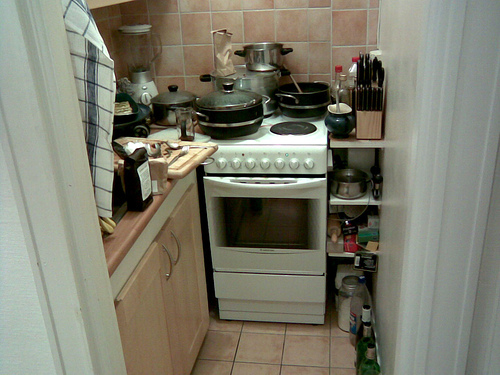 Tiny, narrow and drab you wonder how you can whip up a spicy penne sausage dish in such a hideous, tiny and ugly kitchen. I fear the bathroom and kitchen will be the hardest to work with. I cannot picture a beautiful kitchen when dealing with ugly, outdated appliances, counters and floor space. But there is always hope! 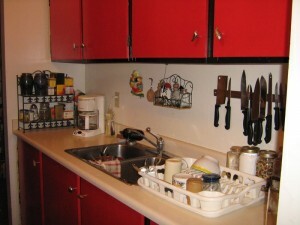 What I would do with this drab kitchen is put down a colorful mat with chocolates and yellows, maybe some red in there. I would paint the boring walls a deep gray and add some post-Impressionist art on the wall adjacent to the sink and paint those forlorn cabinets ivory or something. I would add red curtains to the tiny window and add a wall pantry shelf adjacent to the sink with spices, olive oils, aged balsamic vinegars and some wine. Voila!